It is the process of building metal structures, equipment machinery and devices by the metal fabricators. This process involves cutting, bending, forming, machining and assembling metal parts to create the required product. When you have a metal product that cannot be manufactured by molding, extrusion or other methods, you can use metal fabrication service to make it. Fabrication service is used widely to make the metal products that are not available in the market. It is useful in repairing and fixing large equipment, machinery and vehicles. Solid Metal Group provides all types of custom fabrication services under the same roof. It is generally the first process in metal fabrication. The raw metal stock is cut into the desired shape, size and thickness using the cutting tools. The type of cutting tool used for this purpose depends on the type, thickness, size and property of the metal stock. From simple hand tools to small and large power tools, there are different types of cutting tools that are used to cut metal items. It is used to join two different metal parts. 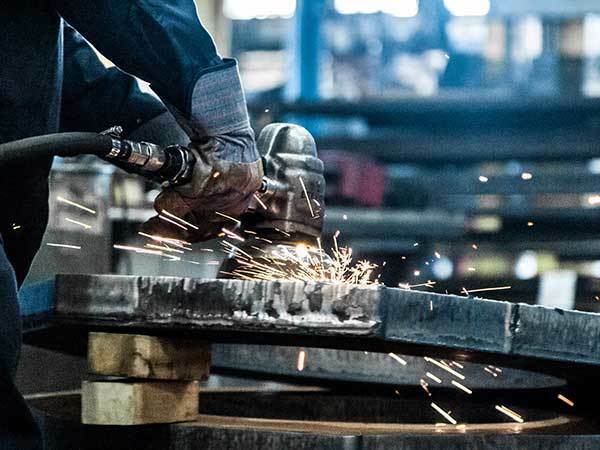 The type of welding technique used in a fabrication process depends on the type, thickness, size, shape and property of the metal parts that require joining. Solid Metal Group has all types of welding equipment. We have expert welders who know the job well. You are assured of high quality welds that will meet the highest standards and can withstand high level of stress. This method is generally used with thin metal sheets but thicker metal stocks also require bending. A thick metal piece generally requires heating at the bending spot before it can be bent. It is used to cut and shape the sheet metal. It involves removal of unwanted parts from a metal stock. Smaller metal workpieces can be machined with the help of a lathe machine but larger pieces require other methods. CNC machining is used for precision and intricate designing of metal parts. Steel fabrication requires use of special heavy duty tools and equipment. A die and punch are used to remove the unwanted parts from a metal stock. It is used to create holes in the sheet metal. Sometimes the purpose of punching is to make a hole in the workpiece while at other times the purpose is to remove the required part from the raw material. It is used to raise a part of the material with the help of a die. Some metal pieces require stretching or shrinking. A metal piece is heated so that it expands and allows insertion of another metal piece into it. As the heated piece cools and shrinks, it tightens around the second piece. Heating and hammering are used to stretch metal pieces. There are other techniques used to shrink and stretch metal parts. Most fabricated metal items are used in applications where they are critical to the operations of equipment, machinery and processes. You cannot take risks with poor quality fabrication. Solid Metal Group has experienced welders and other professional metal fabricators. You are assured of high quality fabricated structures that will meet the highest standards of your industry. Consult our expert fabricators if you need any help with your fabrication project.